What does the Bible say about Virgin Mary? 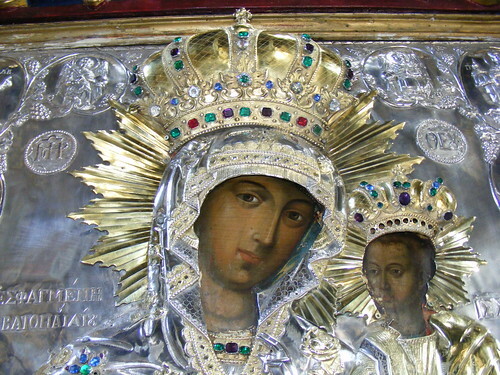 I have a question about the faith and veneration at a very high level the Orthodox Christians do with regard to Mary, the mother of Jesus. Why do they consider that she was virgin until death and that she rose from the dead and ascended to heaven. Why do they consider that she had no children and that Jesus’ brothers were either disciples or children of Joseph from his first marriage after which he remained a widower? After all, in the Gospels of Matthew, Mark and Luke there are mentioned the moments when the brothers together with Mary came to Jesus to call Him out? And how do they venerate the “Mother of the Lord” almost like God, when the Old Testament says that God is a jealous One and He does not want His glory to be given to anyone? Why is it not written very exactly in the Bible if Mary had other children besides Jesus or not? Thanks in advance for your response which I will wait with great pleasure. After the crucifixion, resurrection and ascension of the Lord Jesus to heaven many started to write different works, that claimed to be holy writings.But in the Church, through the guidance of the Holy Spirit, there were recognized as inspired by God only 27 canonical books that were included in the New Testament.In addition, there were many writings which came into conflict with the canonical books because of their content. These writings were called “apocrypha”, i.e. hidden writings.They have given rise to many heresies and discussions during the entire history of the Christian Church.Recently, Dan Brown has used some of these writings and wrote the book “DaVinci’s Code” to attack the Christian faith. True Christians, who have chosen to follow the healthy doctrine of Jesus Christ, have set as the foundation of their faith the canonical books of the Old and New Testaments.Therefore, I will answer your question only based on what is written in the Scripture, more specifically in the New Testament, where there are stories about Mary, the mother of Jesus. The term “ever-virgin” means that Mary remained a virgin after the birth of Jesus Christ just as she was a virgin until His birth and this also implies that she has never have intimate relations with her husband Joseph and she did not give birth to other children. Let’s see what the Bible says in this regard. So, Mary was pregnant before she live with Joseph, that is before she had intimate relations with him and Joseph kept her virgin until she gave birth to a Son. Has Mary given birth to other children after Jesus? So, Jesus had brothers and sisters and the Scripture does not say that it was something unusual in their family, that Joseph would have been married before, that brothers of Jesus were his children from his first marriage, or that they were the cousins of Jesus.Instead, people saw in Jesus and in their family nothing unusual than others. That is why they were astonished at his doctrine. There is no specific indication about such events, as the resurrection and ascension of Mary in the New Testament. How have the Apostles acted? In the New Testament writings we do not find the apostles or the early church to venerate the Mother of the Lord, or to say that her person was a substantial part of their worship.If it were so, they could not overlook this practice that is widespread today. When she was at the wedding in Cana and the wine gave up, Jesus’ mother told the servants to do whatever Jesus told them to do.Certainly that it remains her most important message for all people of all times.To do our utmost to know the Lord Jesus and do everything He says.God help us so.